Here’s a little more cardboard aided design. 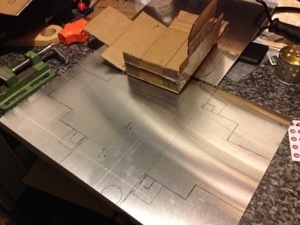 The model and the flat sheet for the electrics box. And here’s the box in the frame. Still a lot of tweaks and connections to make, but it’s in there nonetheless. Session time: 4 hrs. Total time: 37 hrs.